THE HAGUE, Netherlands (JTA) — On his way to several meetings with Dutch parliamentarians last week, Palestinian Authority President Mahmoud Abbas and his entourage passed 300 demonstrators flying Israeli flags. Like the Israeli government, the protesters, who convened outside at the urging of Dutch Jewish and Christian pro-Israel groups, accuse Abbas and his government of supporting deadly attacks against Jews. Incitement by Abbas and others, they charge, is a major catalyst for the recent wave of Palestinian terrorism in which 11 Jewish-Israelis have been killed and more than 50 Palestinians have died, including dozens identified by Israel as assailants, in Israel’s attempt to stem the violence. Their argument echoes one that Israeli Prime Minister Benjamin Netanyahu and his European envoys have been making regularly since September, when the latest round of unrest began. But neither appears to have had much impact on how the Palestinian leader is received by European leaders. On his recent trip to the continent, Abbas visited Switzerland, Belgium and the Netherlands, meeting with top EU leaders and receiving the honor of an audience with Dutch King Willem-Alexander. In September, the mayor of Paris bestowed the Grand Vermeil medal, the city’s highest honor, for Abbas’ efforts to achieve peace. Such gestures have angered many Israel supporters in Europe, particularly in light of recent comments seen as encouraging violence against Jews. “We welcome every drop of blood spilled in Jerusalem,” Abbas said on Palestinian television in September. 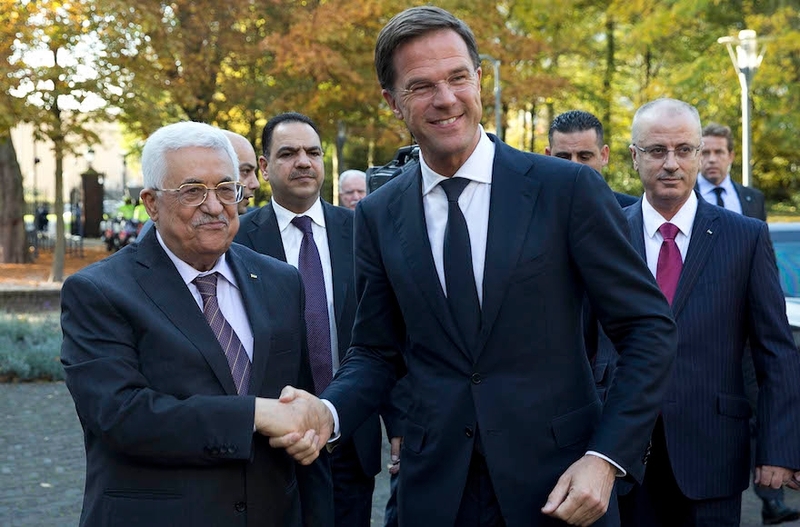 European leaders remain willing to embrace Abbas because they fear the alternatives could be worse, according to Uri Rosenthal, who served as Dutch foreign minister from 2010 to 2012. It is “not because the Palestinian record is so great, but out of a political calculus in which Abbas is seen as the only [other] option to Hamas or to chaos,” Rosenthal told JTA. Beyond this lies growing resentment in European capitals toward Netanyahu, who has alienated many European leaders with his hard-line stance on peace talks, his refusal to halt settlement construction and, most recently, his controversial claim about the role of a Palestinian leader leading up to the Holocaust. That view was endorsed by a senior European diplomat, who spoke to JTA on condition of anonymity, citing regulations prohibiting officials from expressing private views. Netanyahu’s inflammatory rhetoric, including his warning on the eve of Israeli elections in March that “masses” of Arabs were coming out to vote, diminished European good will toward the Jewish state and its receptiveness to Israeli complaints, the diplomat said. Adding to the problem is the perception that Netanyahu is looking for any excuse to avoid making progress toward peace. “For a long time, this has been the one issue that Israel presented as the main problem to moving forward with peace talks — simply because it was the only thing Israel could think of to stall progress,” the diplomat said. In his talks in Europe, Abbas used Netanyahu’s rhetoric and settlement policy to deflect criticism. Settlement construction and Israeli occupation “drive Palestinian violence — not any words spoken by a Palestinian leader,” Abbas told a delegation of the Center for Information and Documentation on Israel, the Dutch Jewish community’s main pro-Israel lobby and watchdog on anti-Semitism. As for incitement, Abbas said at the Oct. 30 meeting, “it is not only coming from the Palestinian side,” adding that he would be willing to discuss “all incitement, Israeli and Palestinian,” with Israel and the United States, but that Israel is not interested. Saeb Erekat, a senior Palestinian negotiator who also attended the CIDI meeting, described as “shameful and inciting” Netanyahu’s statement on Oct. 20 that Haj Amin al-Husseini, a pro-Nazi Palestinian leader, advised Adolf Hitler to “burn the Jews.” Netanyahu subsequently said he did not mean to diminish Hitler’s responsibility for the Holocaust.